So I decided to enter this race a week before it was on, with a bit of gentle encouragement from Mariead and a belly full of nerves for my lack of race prep for HOTW. 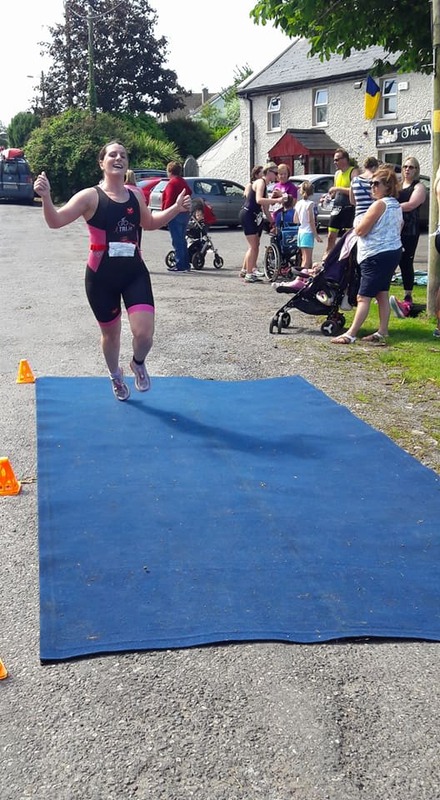 I wasn’t able to race in Kilrush this year so I said why not go down and improve my transitions, and have my 3rd open water swim on the year!!! Woke up with a spring in my step as the sun was shining and sang to the 90’s tunes on 2fm the whole way down. Felt super relaxed when I got to Dromineer. Got registered and into transition pretty quickly and realised I probably should have brought some sunscreen (will def be a new addition to the race day list)..
My pre race routine has been pretty simple, get transition sorted and then get chatting. Was nice to see some familiar faces out to support us – Joanne and Mairead. The heat was getting to me a bit so I decided to go and hang out “under the tree” with Ger Bowen – preserving energy as we watched some people carry out their “long” warm-up routines!! Everyone was enjoying the pre race sunshine while Nigel, Stephan, Ger and I took to acting as security at the bag drop (in the shade) while watching the tri a tri swim and admiring how out of place Ger’s bike looked in the tri a tri rack! Got into the water and got hauled back out pretty quickly as we weren’t counted in.. so back in for round two.. There was only one wave so it was a bit of mayhem when we all took off. I wasn’t too fond of the swim as it got quite congested at the buoys and I had one or two digs on the way out. I didn’t have a great swim and I knew it getting out of the water – I felt like I was in there for an age and my time proved it! Into transition out as quick as I could – finally getting out under the minute.. no more dawdling.. So off I went in my bike, I felt strong and with the addition of some tri bars (thanks Emma) I was motoring along. I started passing out a few women (and men) along the way and with a bit of “I pass out, you pass out” with a two guys, one from Nass and the other from Limerick, the competitive spirit kicked in and I just kept chasing the bike infront. No gadgets or watches for me just keep pedalling hard.. You have to be comfortable with being uncomfortable in a race! The home stretch flew by and all of a sudden I was back in Dromineer passing out a girl in the village and the other on the dismount line – not realising they were 1st and 2nd. All I wanted to do was get in and out of transition as quickly as I could – my best time yet and best of the Go Tri gang. Apologies for the gloat but I am usually the slowest. I have been asked in more than 1 occasion do I straighten my hair inside there?! Onto the uphill run and I tried to keep it steady. Met the encouragement of Stephan telling me to dig deep and I tried to push on a bit but girl in second caught up to me, and then passed me out – think you gave her more encouragement Ste.. Thought to myself “ok try and keep with her”, knowing that I didn’t have it in my legs. But then again neither did she, 200yards down the road she cramped up and I kindly said “keep shuffling and you’ll be fine” but in my head to myself “push on and open a gap if you can”. Got to the turnaround and realised that no girl had went against me and then my mind started playing tricks and 2nd and 3rd were hot on my heels.. Met Nigel and a few others who were really encouraging – Jason Hanrahan’s shout “first lady Rita” and in my head “shag off there is 2k to go!”. I tried to push hard up the last hill but I had nothing left in my legs so just kept working my arms knowing it would get me to the top. Heard many footsteps behind me wondering is this the moment I get passed out so I refocused and started to pick up the pace on the downhill. Plan was to just let the legs go and work hard and that plan didn’t fail me. Made it over the line with a minute to spare, with shaking legs and tomato coloured skin from the lack of sunscreen. Thanks Mairead for the bottle of water over my head, it was badly needed. 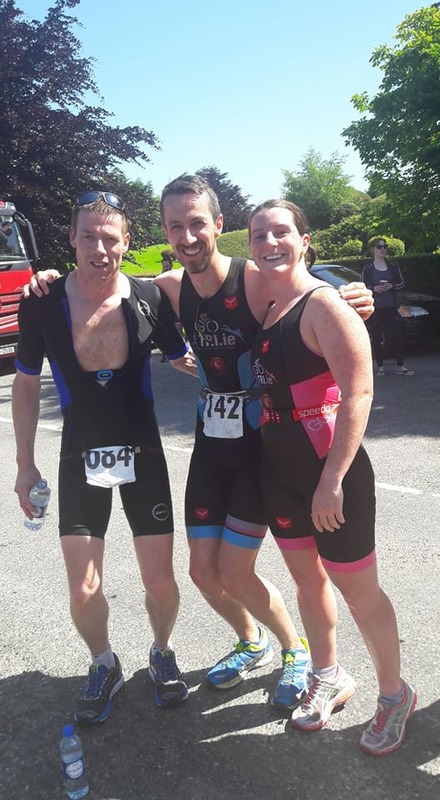 All in all a fantastic club race in a gorgeous location, hats off to Nenagh Tri. Thanks to the supporters Joanne and Mairead and the three GoTri lads for the craic in the warmup even if Nigel was like a hen in a hot griddle peppering around! Onwards to Kilkee this weekend!